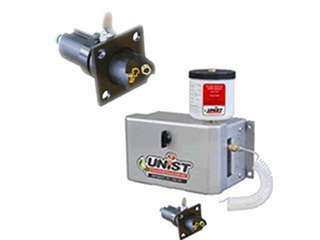 Unist saw blade lubrication systems deliver all the benefits of Minimum Quantity Lubrication (MQL) to your band or circular saw in a durable, easy-to-install package. Longer lasting blades, better cut quality, fluid savings, and clean, dry chips are just a few of the reasons people love our systems. Formulated Specifically for Sawing with Micro-Management Systems. Misting system with a 3" BAT nozzle. System designed to work on all vertical band saws. The BAT Nozzle is the standard nozzle for Bandsaw and Circular saws and was designed to easily fit on a wide variety of circular saws, vertical band saws, and horizontal band saws. The nozzle includes a 1.75? (45 mm) square mounting flange that can be attached to the blade guard. A 1? (25 mm) diameter hole drilled through the guard allows the nozzle to be centered over the blade. The nozzle position can then be adjusted as close to the blade as required with a thumb screw. Two outlets on the sides of the blade and a third outlet spraying directly into the gullet of the teeth assure superior application of lubricant to the saw blade. Model 12218 includes the pump body, 16 oz. reservoir, hoses and mounting hardware for the single 3" Bat Nozzle. If you're currently using flood coolant on your saw, switching to a Unist saw blade lubrication system will completely eliminate the need for coolant, alleviating the health and safety concerns it creates as well as the ongoing costs of treatment and disposal. Precise fluid application is the key to maximizing the benefits of Minimum Quantity Lubrication. Applying too much lubricant is a waste and can adversely affect chip formation, whereas inadequate lubricant reduces blade life. Precise fluid application requires accurate pumps for consistent lubricant delivery and appropriate nozzles to create and direct the spray. The adjustable positive displacement pumps used in our systems have a proven track record of consistency and reliability. Each pump module includes a stroke adjustment for the pump output and a precise metering screw for the nozzle air flow. The combination of these adjustments provides complete control of the spray output. Although supplying the perfect amount of fluid is important, it doesn't do any good unless it is properly delivered to the cutting tool/work piece interface. To make this possible, Unist has developed several nozzles to precisely apply the lubricant in nearly any metal sawing operation. Misting system with a 3" BAT nozzle. System designed to work on all vertical band saws. The BAT Nozzle is the standard nozzle for Bandsaw and Circular saws and was designed to easily fit on a wide variety of circular saws, vertical band saws, and horizontal band saws. The nozzle includes a 1.75" (45 mm) square mounting flange that can be attached to the blade guard. A 1" (25 mm) diameter hole drilled through the guard allows the nozzle to be centered over the blade. The nozzle position can then be adjusted as close to the blade as required with a thumb screw. Two outlets on the sides of the blade and a third outlet spraying directly into the gullet of the teeth assure superior application of lubricant to the saw blade. Model 12218 includes the pump body, 16 oz. reservoir, hoses and mounting hardware for the single 3" Bat Nozzle. Misting system with collapsible nozzle for Horizontal Saws. Used on saws with a blade width of less than 1". On some horizontal band saws, there is not enough room to mount the Bat Nozzle. For these situations, Unist offers two additional nozzles engineered specifically for horizontal band saw applications. The Collapsible Blade Nozzle is mounted to the leading blade guide and straddles the blade with legs which spray directly up and into the blade teeth on both sides. The legs are collapsible and retract into the nozzle body at the end of the cut. Model 12219 includes the pump body, 16 oz. reservoir, hoses and mounting hardware for the single Collapsible Blade Nozzle. Misting system with collapsible nozzle for Horizontal Saws. Used on saws with a blade width of 1 to 2" widths. 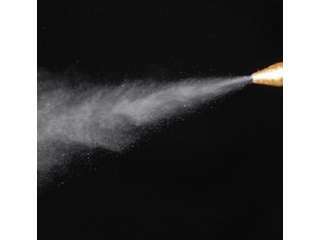 The Guide Nozzle is designed to accompany the Collapsible Blade Nozzle. The Guide Nozzle applies lubricant to the blade where it comes in contact with the guides to reduce friction and extend blade and guide life. Model 12220 includes the pump body, 16 oz. reservoir, hoses and mounting hardware for both the Guide Nozzle and the Collapsible Blade Nozzle.